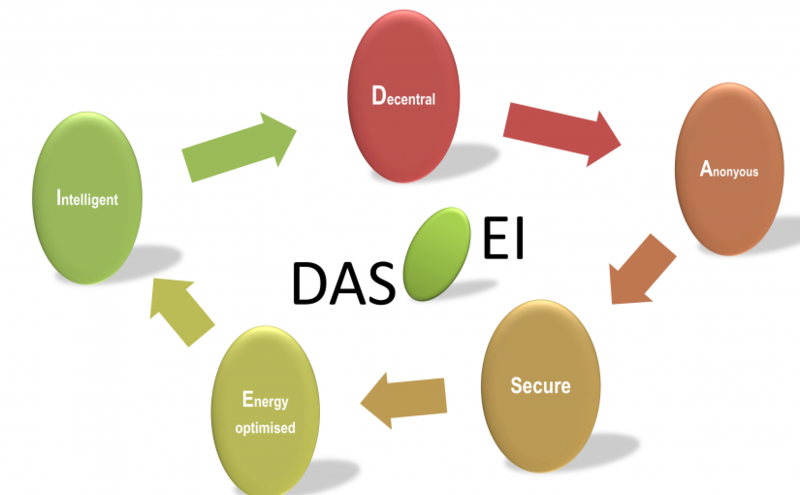 The DAS-EI project has been accompanied by GISAD from the beginning. The energy market has been gaining considerable momentum in the last few years, driven by ever cheaper solar energy. Photovoltaic systems are the epitome of decentralisation. So you might think that there are a large number of projects such as swarm-coupled batteries, which could be considered as a best practice. Even if the decentralised distribution of batteries leads to shorter latency periods and larger failure redundancies than a central battery storage concept, such swarm concepts offer a large number of potential new vulnerabilities to attackers. Already today, it is possible to derive and create a detailed profile for each user from their power consumption alone. Swarm concepts also displace regional electricity suppliers and store a large amount of personal information centrally. Indeed, most data relating to swarm batteries is processed by a single control centre and the electricity is made available to the power grid. As a result, through smart meters, seamless monitoring occurs, which will not even stop at our doorstep as the last refuge. From a social point of view, such concepts are extremely questionable. Swarm batteries interact both via an encrypted internet connection with a central location as well as on the intranet with smart home devices from various manufacturers. Everything is then also displayed on smartphones using various apps. Current events where hundreds of thousands of household appliances are interconnected to form so-called botnets and to a large extent have paralysed large parts of the internet infrastructure are only the beginning of an alarming development of the centralisation of actually decentralised units. Please also read the Trusted WEB 4.0 blog Nannybot attacks small child and In the USA, Donald Trump becomes President – Finns freeze because of hacked heaters . Everyone who uses such systems runs the risk of not only permanently being monitored but also inviting a criminal organisation in the form of networked smart devices into their homes. As can be seen from the eternal back and forth in the discussion on interference liability of operators of W-LAN systems, with increasing cyber-attacks, it cannot be ruled out that legislative changes will threaten device owners with civil and criminal penalties as a result of external manipulation of devices in their own homes. A liability can already be established where your device is not maintained to the current update status. Although it is primarily a small project about control technology, using quite simple means, all claims of GISAD for a Trusted WEB 4.0 project were met in this instance. In accordance with the claim of a global decentralisation, inverters, that are available on the market, were used to connect to the power grid using an intelligent meter. However, only the amount of power produced minus the power consumed is communicated to the power grid, in addition to the amount of power generated by the PV system. Using a swarm battery is possible. However, this is then not integrated in the intelligent management of household appliances, but stores only the surplus electricity after deducting the own power consumption and feeds it onwards when necessary. Profiles created from the fluctuations of one’s own consumption are blurred, since energy consumers are adjusted to the yield curve of the photovoltaic system and the usage of individual household appliances is not communicated externally. So far, there are hardly any projects that deal with the optimum energy yield in private households. After the initial tests, we predict that by the end of 2017, we will already be able to economically use almost 100% of the PV electricity produced on site for self-consumption. Only in the summer months is there a significant surplus of electricity, which will be fed into the grid. Not only on the internet, but also within the home, it is possible to do without a control centre, to a large extent. The individual sensor servers collect a lot of information about light, humidity, temperature and movement. With this information, they work largely autonomously and will communicate with each other in the future, instead of being controlled by a central unit. All of the electrical consumers in the household are recorded on a list. Appliances such as refrigerators, washing machines or dishwashers, which can be operated and optimised in terms of energy, are part of the concept. A connection to the internet is only briefly established to display status messages to send to the user. Remote switching via the internet is currently not yet integrated. However, there is also an already patent-pending secure solution for this purpose. Data protection and data security are established insofar as the sensor servers are not reachable via a common operating system and cannot even be controlled remotely over the intranet. Data protection is also ensured through a concept which handles a reorganisation of the value chain and all involved areas such as update service, customer relation service, relations with suppliers and logistics.